While growing up in Gambia, Africa, Balanding Manneh experienced hunger intimately — losing childhood friends to starvation and malnutrition-related illnesses. Now an undergraduate at Arizona State University, those painful events have propelled him to work on ending hunger around the world. To recognize those accomplishments, Stop Hunger Now, a non-profit hunger relief organization, and the North Carolina State University Center for Student Leadership, Ethics and Public Service, named Manneh as the 2016 President William Jefferson Clinton Global Hunger Leadership Award recipient. The award, first presented in 2009, honors former President Bill Clinton for his commitment to humanitarian causes, including the eradication of hunger. Manneh is the award’s eighth recipient. “It’s one thing to see pictures of hungry people on television, but it’s another thing to actually experience it firsthand like I did growing up,” Manneh said. In 2014, Manneh founded Rural Impact, a non-profit organization that supports young people, women and rural farmers in developing countries by providing them with the resources and training to engage in activities that generate income. The organization teaches agricultural best practices and encourages community dialogues on how to sustainably track issues related to hunger, malnutrition and poverty. For creating Rural Impact, Manneh received an African Youth Excellence Award in Public Service nomination in 2015. 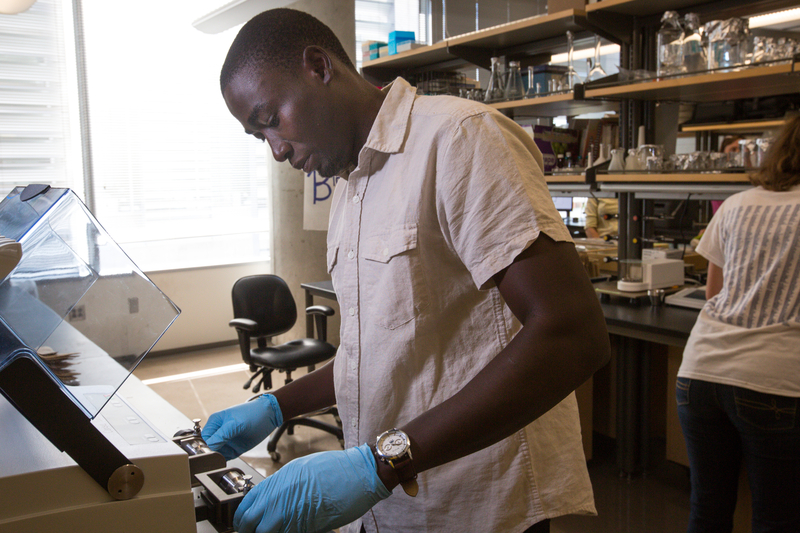 Manneh participates in the School of Life Sciences Undergraduate Research program. He studies the impact of locusts on crops and works alongside faculty with ASU’s Julie Ann Wrigley Global Institute of Sustainability. Their research focuses on projects aimed at protecting livelihoods and fighting food insecurity in Senegal, West Africa. Manneh will receive the award at the Universities Fighting World Hunger Summit held in Missouri on Feb. 27. Six months before the events of Ferguson, Missouri, made officer-involved shootings the focal point of national debate, the Phoenix Police Department was already examining its own incidents involving use of force. The report, released in October, reviewed five years worth of police shootings from 2009 to 2014. Researchers looked at 122 cases in which 198 officers fired their weapons. The goal was to identify patterns in officers’ practices that resulted in deadly force. The agency averaged 21.5 incidents a year with a low of 14 in 2009 and a high of 31 officer involved shootings in 2013. The unusually high number prompted the report. David Choate, one of two ASU researchers who analyzed the data, credits the police department for undertaking the review when it did. Of the 198 officers who fired their weapons, 36 cases were under review and excluded from the study. Researchers were able to analyze the actions of 159 officers. Of those officers, 97% were determined to have acted within departmental policy. Four officers were found to have violated policy and procedures dealing with use of deadly force. The review revealed several areas where training and documentation can be improved. It cited the the lack of in-service training, failure to properly document training for all officers, particularly those involved in shootings. The study disclosed the lack of training using de-escalation tactics and lack of accountability in the reviews and training following incidents of officer involved shootings. A grading system used to evaluate cases was also found to be too binary — labeling the shootings either “in-policy” or “out-of-policy,” instead of evaluating each individual stage of the shooting as either in or out-of-policy. “The report has been used both internally to improve processes and shared publicly to help provide transparency,” said Sgt. Trent Crump, with the Phoenix Police Department’s Public Affairs Bureau. Along with impacting Phoenix Police Department policy, the report has the ability to influence other departments around the country. The agency’s study and proposed policy reforms can also be modeled by other agencies looking for ways to analyze and lower their number of officer involved shootings. “I think it’s helpful for other agencies that want to address and assess the problem they have. It kind of sets an example of how to go about it,” said Lidia Nuño, a senior research analyst with the ASU Center for Violence Prevention and Community Safety. The center helped the Phoenix Police Department turn hundreds of case files into a database that could be analyzed. With the analysis of the data, the report was able to recommend policy changes that better addressed the recurring factors leading to the department’s use of deadly force. Those recommendations include: more officer training in de-escalation techniques; establishing a tactical review committee to assess cases in which officers fired their weapons; continuing to produce an annual report of all officer involved shooting incidents and collecting and analyzing more data on how these incidents are affected by substance abuse, mental illness, officer de-escalation of force, and other contributing factors. Coming up with recommendations involved combining the voices of researchers from the ASU Center of Violence Prevention and Community Safety and Phoenix police officers who collaborated on the report. It’s a process Nuño says required an endless number of meetings and hours and hours of back and forth conversation between the officers and the researchers. They came up with ideas for policy reforms and recommendations, which grew organically as different people added to or revised parts of the ideas presented. The team compared the department’s practices with those suggested by the U.S. Department of Justice’s “Collaborative Reform Model,” which was implemented following a record number of officer involved shootings by the Las Vegas Metropolitan Police Department. The ASU researchers found areas where the Phoenix Police Department met or exceeded federal reform model practices, and made recommendations based on where the agency needed improvement. Nuño says that the collaborative effort with Phoenix Police provides another approach for law enforcement agencies to study and address their own policies regarding officer involved shootings. “Now, other police departments have two models to look at. They have Vegas and us,” Nuño said. The Phoenix Police Department valued Nuño and Choate’s analysis, not only for the researchers’ expertise, but also for their perspective as outsiders. 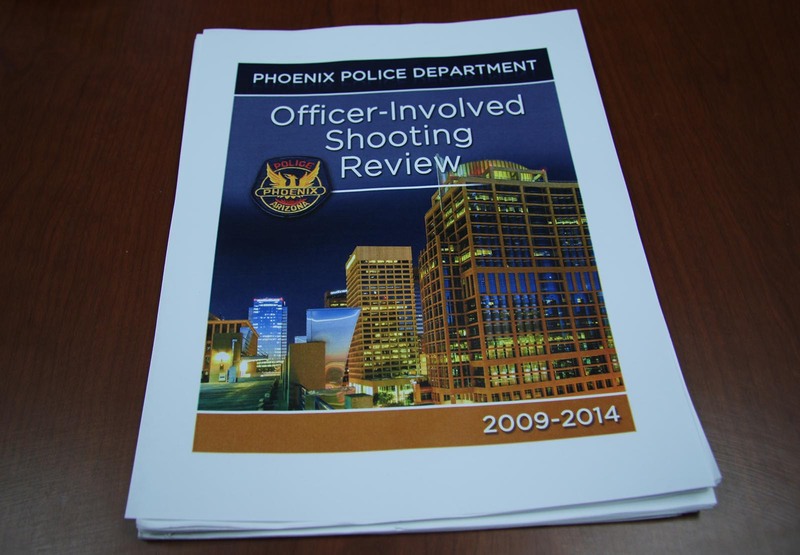 Rather than cover up or avoid publicizing officer involved shootings, the Phoenix Police Department used the report’s recommendations to take a closer look at officers’ use of deadly force and explore its contributing factors. The report prompted department leadership to immediately assign appropriate staff to enact policies, procedures, and practices to implement the recommendations. They also required all sworn police employees to complete 40 hours of training that includes a more appropriate response to people with mental health disorders and a focus on de-escalation techniques. Members of the research team say they made progress in changing department policy to reduce officer involved shootings, but there are other goals they would like to achieve given more resources. These would include collecting and analyzing data on other factors that contribute to deadly use of force such as racial bias, criminal history of the subject and history of serious mental illness. Despite the information the project team would have liked to include in the review, it still remains only one of a few reports of its kind that analyzes data on a police department’s officer involved shootings and makes recommendations on how those incidents can be avoided. It has the potential to be used as a national model, just like the Justice Department’s “Collaborative Reform Model,” which helped guide this report.